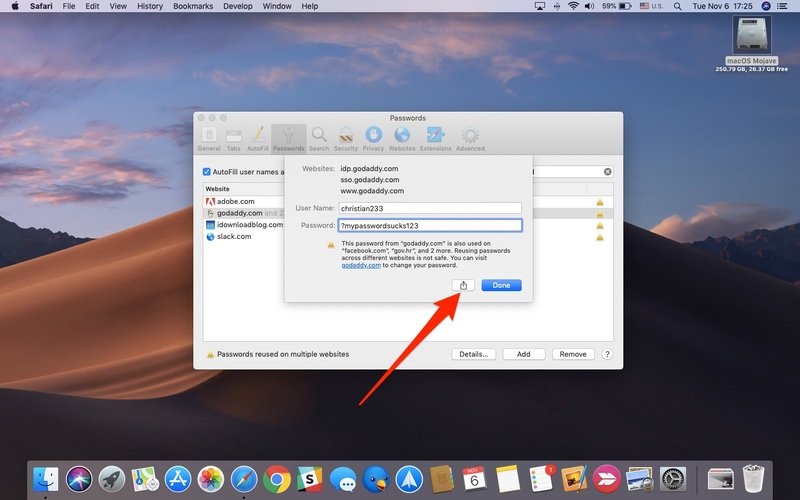 iOS 12 and macOS 10.14 Mojave have brought out a cool new feature allowing you to wirelessly send a saved website or app password from one iPhone, iPad or Mac to another nearby device using AirDrop, Apple’s proprietary peer-to-peer file transfer feature that works across iOS and macOS. 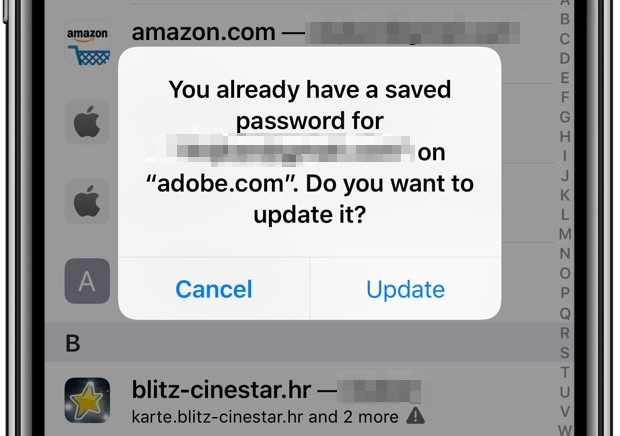 A password sent through AirDrop is automatically saved in the Safari passwords as part of a target device’s system keychain. A password is sent along with its accompanying user name. If the entry already exists on a target device, the user will be asked if they would like to replace their existing password with the one you just sent through AirDrop. To access the saved website and app passwords on your Mac, open the Safari browser, then choose Preferences from the Safari menu and click the Passwords tab. On iPhone, iPad or iPod touch, saved website passwords can be managed in Settings → Passwords & Accounts → Website & App Passwords. 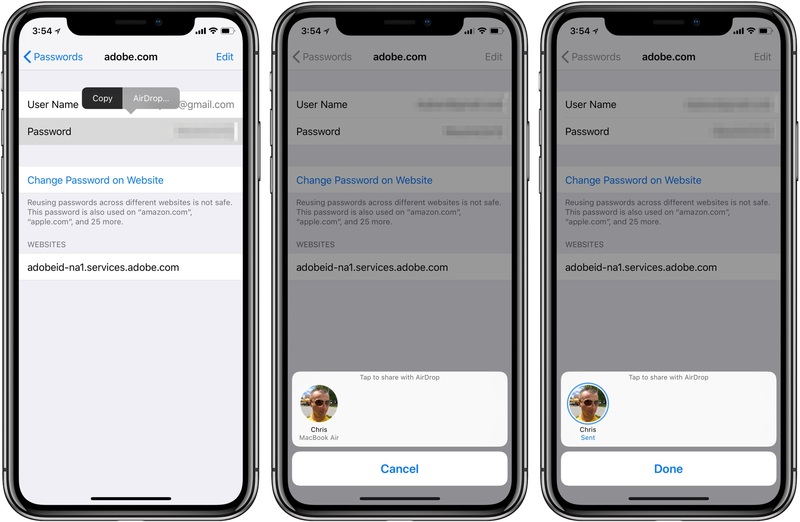 Sending passwords via AirDrop might be especially useful to the types who prefer not to have their passwords synchronized across devices or the kinds of people who just want to share their Netflix password with friends. 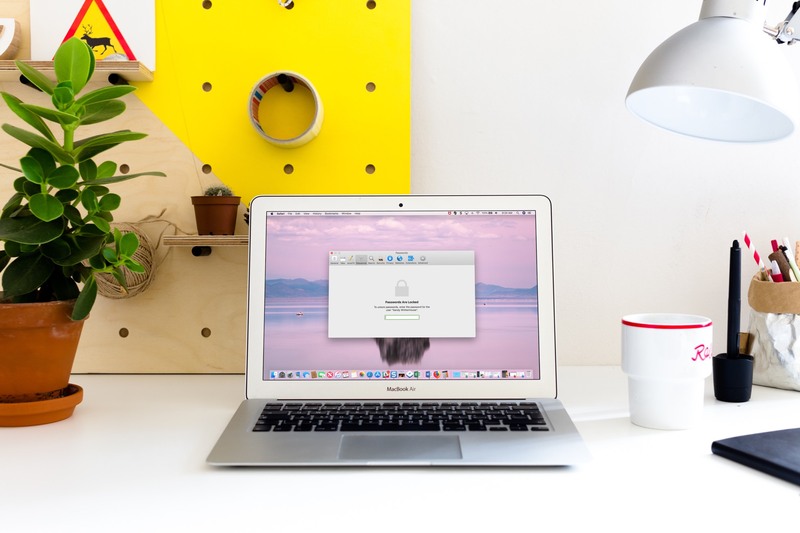 The AirDrop option for passwords is hidden from plain sight, here’s how to use it. To do this on iOS 12+, you must head into Settings. 1) Open the Settings app on your iPhone, iPad or iPod touch. 2) Tap Passwords & Accounts. 3) Tap Website & App Passwords and authenticate with Face ID/Touch ID or your passcode. 4) Tap a saved entry on the list. 5) Tap and hold the User Name or Password field, then choose AirDrop from the bubble menu. 6) Select a nearby device from the AirDrop menu to send this item over the air to. The chosen item gets sent to the selected device over the air. If the device already has a saved entry for this website or app, you’ll be asked whether you’d like to update it. Tap Update to have the AirDropped entry replace your own saved password. 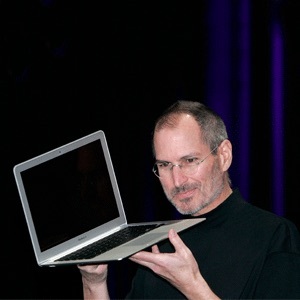 1) Open the Safari browser on your Mac. 2) Click the Safari menu, then choose Preferences. 3) Click the Passwords tab. 4) Now authenticate with Touch ID or type in your administrator password, then double-click a saved entry to access the full details for the saved user name and password. 5) Click the Share button at the bottom of the window. 6) Tap a nearby device from the AirDrop list to send this saved password to. Keep in mind that AirDropping things between iOS devices and Macs requires that the devices be within Bluetooth and Wi-Fi range. Check that you and the person you’re sending to have Wi-Fi and Bluetooth turned on. If either of you have Personal Hotspot on, turn it off. If AirDrop on a target device is set to receive from Contacts Only and you’re not in their Contacts, ask them to temporarily change AirDrop receiving settings to Everyone. 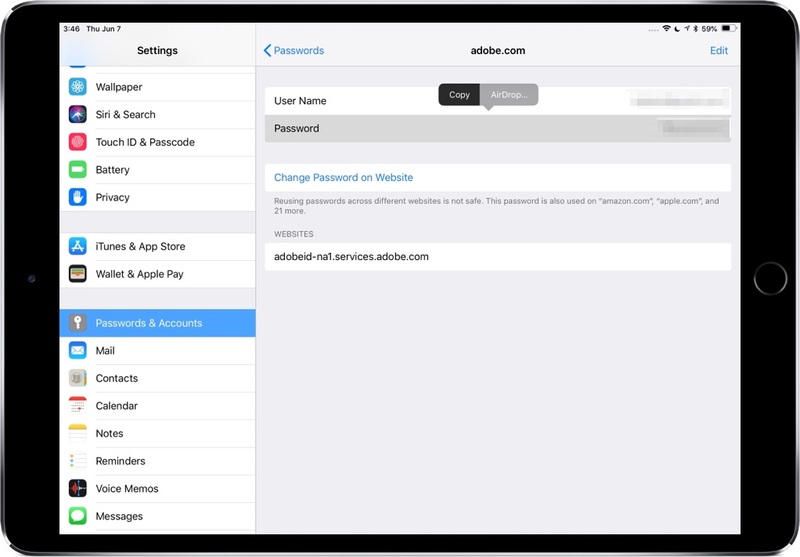 If you happen to use a third-party password manager like 1Password or Apple’s iCloud Keychain feature to keep your saved passwords, credit card information, secure notes and what not up to date on the devices you approve, chances are you won’t be needing this option much. Still, knowing it’s there in case you ever need it should give you a peace of mind. AirDropping a password is especially handy if you have issues with Universal Clipboard, a feature that lets you copy and paste across devices, but is no substitute for it. Whereas Universal Clipboard lets you paste anything into almost any app, an AirDropped password gets automatically saved to the your saved Safari passwords for future use. If you’re concerned about privacy, there’s nothing to worry about because of course your precious passwords are not sent in plain text. Like with photos, documents and other stuff that can be AirDropped, the transmitted content is sent encrypted. If you experience issues using AirDrop, be sure to consult our AirDrop troubleshooter. 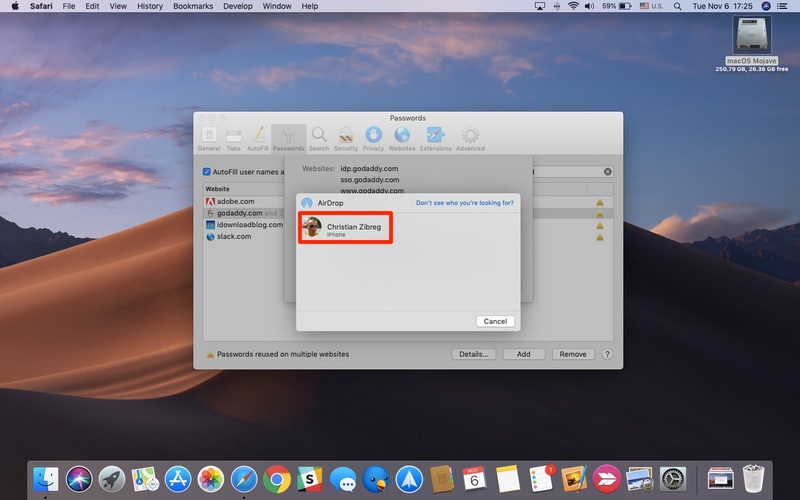 How do you like the AirDrop password-sending feature in iOS 12 and macOS Mojave? Do you plan on using this capability? If so, please share your scenarios with fellow readers.